Internet Explorer 8 still has a strong hold on Internet usage. Therefore, it’s in your best interest to create web content with Edge Animate that all Internet users can see. There’s nothing worse for a web designer than to create content that appears broken or inaccessible to a large segment of the population. It’s imperative that you safeguard your animations from appearing broken by implementing a down-level Stage in association with the Edge Animate poster feature. You can use a poster with the down-level Stage. A poster, in its basic form, is a still image of your composition. You can use the poster instead of your composition when your audience is using an older web browser such as Internet Explorer 8 or earlier. You don’t have to know which browser your audience is using because Edge Animate codes that for you. All you have to do is create the poster and implement the down-level Stage to create backup content in the event your audience isn’t using a modern browser (IE 9 or later, Chrome, Firefox, and Safari). The down-level Stage is put in use when your audience uses a browser that doesn’t fully comply with the advanced animation features of Adobe Edge Animate CC. Given the current worldwide usage of Internet Explorer, especially in the United States, using a down-level Stage is in the best interest of all web content designers and animators. 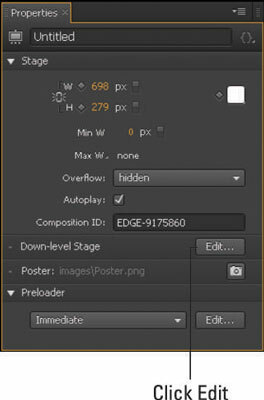 Whether you click Edit from the Down-level Stage section of the Properties panel (see the figure) or you reach the Down-level Stage section while creating a poster, the settings are the same. Click Edit to open the Down-level Stage properties.